There are days when every word I type feels clumsy and I just sit with my fingers resting on the keyboard. I’ll type something, delete all of it, then change my mind and put it back. Sometimes I delete the whole thing and start from scratch. An online journalist’s day is fast-paced, there’s rarely time to spend ages crafting a lengthy feature or news article. You rattle it out and jump on to the next job. It doesn’t mean that you don’t care about what you write, but speed (while maintaining quality) is essential and writer’s block is a luxury. As a student, I used to struggle with writer’s block and usually ended up pulling everything together at the last minute, which is a terrible way to work. Now, I have a different mindset: this article needs to be written and it has to be done today. There’s no wriggle room here – for online work, the deadline is always right this minute. My personal strategy is to try and do the work which requires lots of concentration in the morning, and save the more repetitive jobs for the afternoon when I’ll have less energy. Find your peak writing time and get stuck in. Do something else, if only for a couple of minutes. Stick the kettle on. Go get a glass of water. Check your emails. Anything. You’ll find it easier to write when you turn your attention back to it. Think about what you can add to your writing to make it more interesting. Is there another article you can link it to? Can you add a gallery? Is there an interesting snippet of news you can include? Mix it up to keep your writing fresh. It helps to give yourself a personal deadline to work to. I often set myself a short term goal, such as 20 minutes to finish uploading a recipe or 15 minutes to finish a news story. It helps to keep me motivated. One of the best ways to prevent writer’s block is to be a reader – keep up-to-date with what’s going on by reading news articles and features. I find that social media is often a great source of ideas, especially when you’re looking for different perspectives on a topic. Find someone to talk to about your ideas if you’re really stuck, whether it’s your colleagues, friends, or your mum. Sometimes the easiest way to express a thought clearly is to say it out loud, and a minute’s chat can sometimes be enough to keep you going. If you’re really struggling to find the words, could it be because you don’t have much to work with? If you’re light on information, there’s very little you can do to create something worth reading. It’s always better to have more information than you think you’ll be able to use, because it’s easier to edit an article down than stretch weak material. The same goes for interviews: always get more than you need. One of the best things about online publishing is that you can always upload a story, then keep adding new information to it as it comes in (which also gives you a great excuse to tweet about it again). 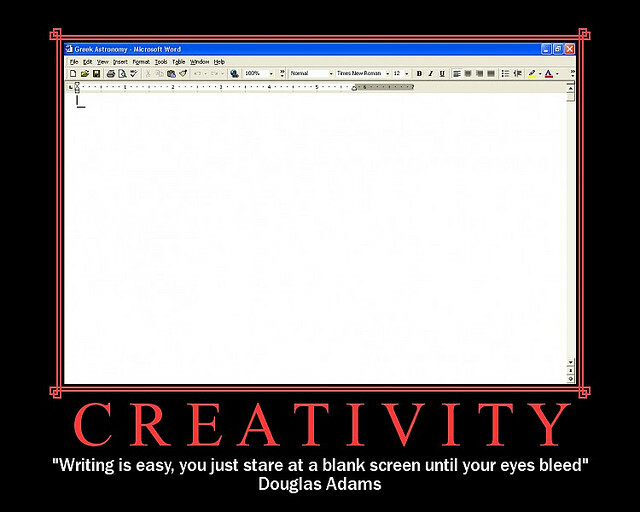 What are your tips for tackling writer’s block? Add them in the comments below.